So, I caught this movie a couple weeks ago and just realized tonight that I forgot to review it. That should tell you a little bit about how I felt about this film. Okay, I know what you're thinking. "MJ, you said in your (500) Days of Summer review that you were single. Why on EARTH did you see The Time Traveler's wife?!" The answer to that question is a simple "Because I wanted to!" I have a soft spot for movies like this with a supernatural twist. Frequency is a great film and The Lake House showed promise in its premise, but ultimately fell flat. Two words: Keanau crying. 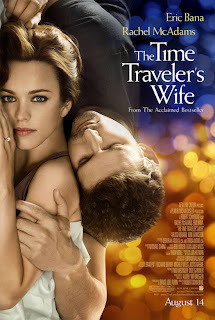 The trailers for The Time Traveler's wife seemed interesting enough and Eric Bana is an awesome actor so my hopes for the film were pretty high. Oh how dismayed I was at what unfolded before me over the next 2 hours. First off, the acting was extremely wooden and awkward. Eric Bana's scenes with his father were almost unbearable and the arguments between McAdams and Bana were nothing short of disastrous. The characters were flat and some of the most illogical people on the face of the planet. At the point where Rachel McAdams' character said "I didn't sign up for a disappearing husband!" I gave up trying to figure her out entirely. All in all The Time Traveler's wife is a complete waste of talented actors thanks to a terrible script and general lack of chemistry. I haven't been this disappointed by a film in a long time and thought the premise was great and could have been used to provide some fantastic human drama with a supernatural spin. It didn't.